The journey that led Archbishop Joseph W. Tobin to become a cardinal begins with two love stories. The first story involves the love of his parents—Joseph and Marie—for each other. “As years go on, I become much more aware and much more grateful for the gift of one’s family, beginning with my parents,” said Cardinal Tobin, the oldest of their 13 children. “My mother had five cousins and three aunts who were nuns. 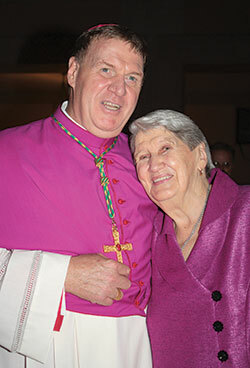 Growing up in a family that lived in one half of a duplex in Detroit for all of his childhood and youth, Cardinal Tobin saw up close the way his father treated his mother and cared for his children. At 19, the future cardinal and his father worked alongside each other as they helped to build a larger house for the family on a small farm in Canada. The cardinal’s father worked for General Motors, but he made sure he kept his work and family life separate. Of course, the reality of nearly every love story is that there are not only chapters of hope, but heartbreak. The cardinal’s dad died during a blizzard in 1977 when he suffered a heart attack after helping people stranded in the snowstorm. “My dad died when he was 54, and he left my mother with 13 children, the youngest of whom were 5 and 6,” Cardinal Tobin recalled. After his father’s death, he went to General Motors to collect his dad’s personal items. While he was familiar with many of the things that his dad kept in a box of belongings, there was one thing he didn’t recognize: a wooden cross that was taped to a calculator. His mother has kept a similar focus on faith, Cardinal Tobin said. She always stressed that her husband was with her through the years, helping her raise their 13 children.